We moved into our new build home about ten months ago and I’m really happy with how it’s coming together. We stuck with the white walls and haven’t made any major changes, it’s just been about getting the right furniture and styling the rooms. We’ve gone for a mid century modern kind of vibe, something that I’m currently writing about, so keep an eye out for it. One area of the house I am struggling with, however, is the hallway. It has ended up just being a dumping ground for shoes and bags and a coat stand groaning under the weight of too many coats and jackets. It’s time for a rethink and a change, here’s my inspiration for a stylish hallway that works for a busy family. As I mentioned before I’m keen on mid century modern and minimalistic styling, well the minimalism is something I’m aiming for with a family that is rather keen on mess and a more maximal approach. We are a busy family of four, we have school bags, huge swimming kit bags, football boots, I could go on and on. I hate it when I open the front door only to be faced with mess, piles of books, bags, shoes and all sorts of odds and ends that have been dumped in the hall. It’s not a great way to greet guests either. I see so many beautifully styled interiors photos but often I’m left wondering where they actually put all their stuff! I don’t just want a beautiful hallway, it has to be one that works hard for us too. Before I start working on styling and sourcing what I need I’m finding a place for everything to live, creating tidier habits and making sure that everyone is on board with the new regime. No more kicking off your shoes and dumping your coat and bag where you stand! This has got me thinking of ways to reduce the clutter and be more organised as a family. So that when I put in the changes and style the space I want we already have good habits formed so it won’t just continue to be a dumping ground, albeit a more stylish one! We have a large downstairs loo so I’ve moved our shoe rack into there so it’s a better use of the space and keeps it hidden! No more tripping over shoes left by the front door. I’ve also given the kids underbed storage for the shoes they don’t need every day access to. My shoes are in my wardrobe upstairs, only my trainers stay downstairs. This means that rack fits the shoes we have and it doesn’t just become another pile of stuff. The groaning coat stand will be the next to go! As with the shoes I want to encourage the family to keep their jackets and coats in their rooms and only have their everyday coats downstairs, giving space for guests and making the hallway look a lot less cluttered. School bags go straight upstairs and hung up their, swimming and gym kits live under the stairs. Keys and post live in the kitchen and important letters and notices from school and clubs get pinned to the kitchen notice board. With new habits being formed, slowly but surely I can now think about the best bit, style. I’d love to have a bench with the coat hooks above it and on the opposite wall a full length mirror. Here’s my inspiration.. I love the simplicity of it and would love to recreate something similar in my hallway. I’ve had a little shop around and put this together for ideas. I’ll also be trawling Ebay and Homesense too. I think a few more weeks of the new clutter free regime and we’ll be ready for the hall way revamp. Of course I’ll be sharing it with you here when I’ve finished. How do you organise your hallway, got any organisation tips or must haves? This post does contain affiliate links that are marked with *, for more info on what affiliate links are then click here. We moved into our new build home in May of last year and I can definitely say that it feels like home now. With it being a new build we’ve been advised not to paint or wallpaper the walls yet, but as each wall is painted white I’m not in much of a rush to change it yet anyway. I do, however, have a few changes up my sleeve to work on our dining room to make the most of our open plan kitchen diner. We have an open plan kitchen diner which I love, in fact it was a huge selling point for me. The kitchen is white with marble effect worktops and a grey tiled floor. The only downside which I clocked immediately was the carpet in the area that would be our dining room. In the plans it suggests using this space as a family room and the room across the hallway as a dining room (also carpeted), but I wanted that room as an office. This is the view from the dining room into the kitchen. and of course the kitchen to the dining room.. I like to think that even though it’s a new build there is a Midcentury and Scandinavian feel to our home, this is achieved by thinking through the furniture and accessories choices and making the most of the white walls and space. I’ve talked a few times about my love for a minimalist vibe and I wish this was reflected more in my home but sadly my children prefer the cluttered, hoarding kind of look! I do try and keep the kitchen as clear as I possibly can, and thanks to plenty of cupboards this is easy, if I’m on top of things and the children don’t just use it as a dumping ground after school. With the room being so neutral I’d love to bring in more colour and texture. I’m loving dark green and leafy botanical prints at the moment so incorporating them in this room will be a must. In fact I’m currently on the lookout for thick dark green curtains for the patio doors and plan to buy a lot more plants! I’d like a more industrial looking dining room table, maybe one with benches, you can see my ideas of Industrial Styling here. Prints are a great way of adding in colour too, or even trying out the trend of hanging plates on the wall as I spotted at the hotel Another Place in their living space recently. As you can see we currently have tiles in the kitchen and a carpeted floor in the dining room. The biggest change I want to make is to do with this, as I really don’t like carpet in dining areas, especially when there’s children at home. Having to shampoo the carpet with stain removers every other day can get rather soul destroying. I’d much prefer wood flooring as with one quick wipe or steam mop and you’re good to go. I contemplated sourcing the same tiles as the kitchen but actually I’d prefer to zone the room a little more and I think wood floors would work better for that. This herringbone pattern has really caught my eye, it brings a mix more texture and style to a neutral room as shown in the picture above. All I need to do is make sure it compliments my kitchen tiles and doesn’t clash with one room flowing into the other. With having heavy oak doors already I think I’ll use them as a guide colour and tone wise. What kind of flooring do you have in your dining room? Got any tips on where I should be looking for my dark green or leafy botanical print curtains? My eldest daughter turns 10 in just a couple of months. 10. T E N. While I try and get over how fast time is whizzing by I’m working on changing up her bedroom and making it feel more like her space. Like most of the rooms in our new build home it’s a black canvas of a white walls with neutral grey carpet. She’s got a few new bits of IKEA furniture but she still needs a desk and lots of accessories that reflect her personality. Our inspiration for the room comes from her love of Harry Potter, Star Wars, oh and unicorns (!) and the colour scheme we’re going with is monochrome with a splash of turquoise. I’d ideally like this room decor to see her through her teen years so I’m trying to keep the big pieces neutral and the accessories and soft furnishings themed as these can be easier updated and replaced in the future as her tastes change. Her previous room in our old house was really small and so she had a cabin bed but in this one she’s got a single white metal frame bed as she has a lot more space, in fact she’s got the biggest bedroom in the house. As I mentioned earlier, we’ve bought her a MALM IKEA bedside table and chest of drawers in light turquoise to replace the storage she’s lost since moving, but the room still feels unfinished. The most important thing she needs is a space to do homework that can also be used as a dressing table. Then it will be the accessories and soft furnishings needed to pull it all together. The wall stickers will go on the wall at the head of her bed where her bedside table and long mirror are. I think the Wayfair desk and Eiffel chair make a great match and will be perfect for homework and make up. I just need to get a mirror, a Hollywood style one with bulbs all around it would be perfect. We’ve also spotted some Star Wars bedding by George at Asda that will definitely be added to the list! I can’t wait to get started once she’s back at school and of course I’ll be sharing the results right here so you can expect to see it in October. You can get more of a feel for the space we want to create by taking a look at my Pinterest inspiration board for pre teen bedroom decor ideas. When we moved into our new home the living room, like most brand new homes, was just a white box with grey carpet. The perfect blank canvas, but also rather daunting! Happily we discovered that all our living room furniture from our previous house all fitted in and worked well. We’ve been in this house for about three months now and have added a few new items to our living room and we’re also planning on a new tv unit, built in shelves and art work on the walls, but here’s what it looks like so far. As you can see, similarly to our old house, we’ve gone for a yellow, grey and blush pink colour theme, with copper accessories. We picked up the armchair on an IKEA trip and I’m so very pleased with it. With all our furniture and the carper being grey it injects some warmth and colour into the room. I love having a laid back Scandinavian vibe in our home and I think this room reflects that well. We were sent a gorgeous copper wire ceiling light from the Artisan Lighting Company and I think it fits the room beautifully. I just need to get a better bulb that’s a little more aesthetically pleasing! Our Zinc sofa from the French Connection for DFS collection is still going strong, though the cushions no longer have that fresh new look. I guess that’s real life and having children for you! I really enjoying spending time in this room, whether it’s watching TV in the evenings, reading a book curled on the armchair or chatting with friends over coffee. I try and keep it as toy free as possible and the children aren’t allowed to eat in here. I guess I’m trying to keep it as a little sanctuary of calm! As I mentioned earlier I’m on the look out for a TV unit for the room to finish it off. We’re getting built in bookshelves for that end of the room too and I can’t wait to unpack all the boxes of books that are cluttering up the office! I’m torn between scouring ebay and auctions for a G-Plan style sideboard or going for something new and more contemporary. I like both of these but I’m still tempted to go G Plan, and Hello Retro have some gorgeous pieces. If you have any questions or would like to know where anything is from then just leave it in a comment below or find me on social media. My least favourite room in our old house was the master bedroom. It was a tiny room with a wardrobe left by the previous owners and barely enough space to walk around the bed. I dreamed of having a light and airy bedroom and lost hours pinning ideas to my Pinterest board. When we bought our new home I already knew exactly the kind of feel I wanted and had earmarked the furniture to go in it. We’ve even got a brand new Bruno mattress for it! As you can see I’ve gone with a laid back look with lots of white and clean lines. I took some inspiration from the rooms at our favourite hotel, Watergate Bay, so it has a relaxed beach feel without the overt ‘beach’ theme. I’m still not 100% happy with the colours, I might switch out the yellow for teal and pale turquoise, at least I can do that without having to worry about repainting walls! As I mentioned earlier we were sent over a Bruno mattress just as we moved so we were lucky enough to have not only a new bed but also a new mattress. Our old mattress was memory foam but had started to sag and dip on one side meaning it wasn’t a very comfortable nights sleep at all. The Bruno mattress arrived all boxed up, all we needed to do was unbox it, and unroll it onto our bed. 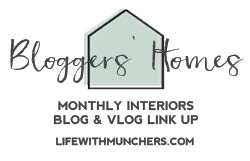 Take a look here for our unboxing and review – as well as my husband knocking a whole vase of peonies onto our bedroom floor!! As you can tell by my over use of the word fantastic, we are really pleased with the new mattress. It has been designed to give support in all the right places, to contour the body meaning that weight is distributed evenly so that there are no pressure points. This is especially good for us as my husband suffers with lower back stiffness and has found that since having this mattress he is sleeping better and no longer waking with back pain. It’s not a memory foam mattress and in the video you can see the support form is cut into 7 different zones. The top layer is natural latex which is hypoallergenic and allows air to flow which keeps you cool in the simmer and warm in the winter. Bruno mattresses are only available online with free delivery & 101 nights to try it. If you don’t love it, they will collect it free of charge, and give you a full refund, no questions asked. I’m so happy with this room is shaping up look and feel wise and of course I’m over the moon to sleep so well in it too. Now if only we could stop the youngest from creeping in during the night and stealing the bed space!